From corporate to cartoon, these Apple execs gave themselves Memoji facials. If Jony Ive was going for that Wanted Poster look for his executive profile picture, he now looks like an adorable puppy thanks to Memoji. 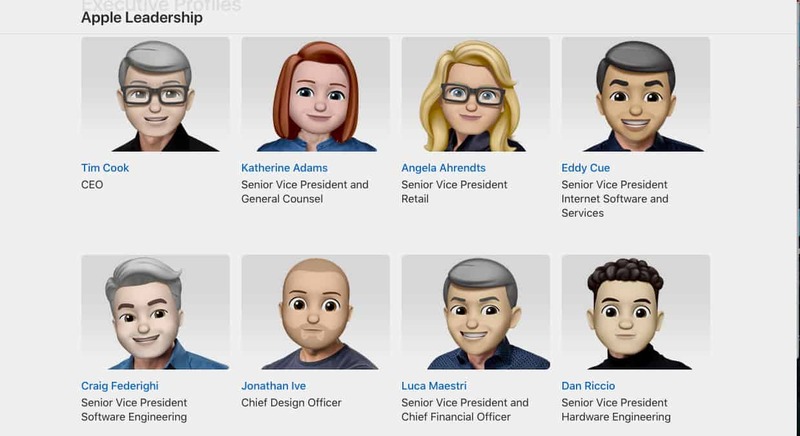 Never has the leadership page on Apple’s website been so fun to peruse as today when executives used the new Memoji feature in iOS 12 to create the cartoonish avatars to celebrate World Emoji Day. The official corporate look prior to World Emoji Day. For Ive, Memoji removed his flinty glare to give him big bright eyes that look like they are about to shed tears. His rugged facial scruff remains, but it is perfectly shaped, much like the products he designs. Memoji lets iPhone X users create their own avatar with a wide range of shapes, templates for skin and hair color and an inventory of eyes, eyebrows and noses. The effect, while decently accurate, fails to capture the more subtle characteristics of expression. Emoji has its own aesthetic and is more fun than accurate. 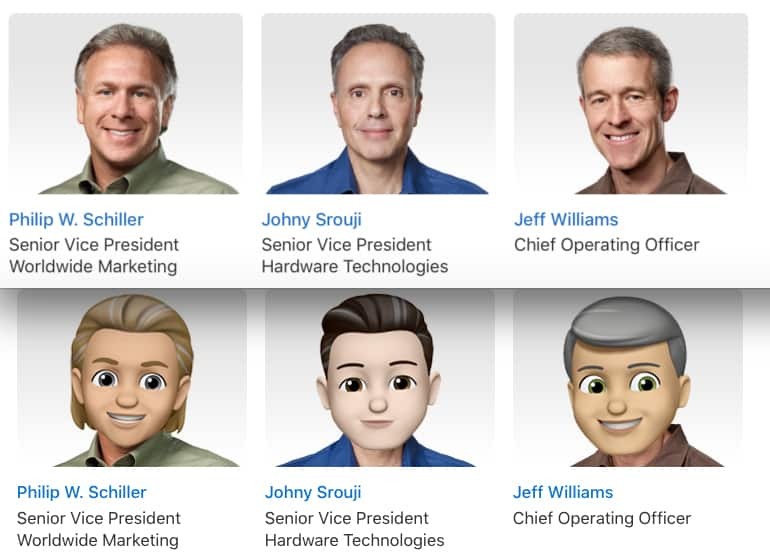 Phil Schiller, left, got a Memoji mullet. 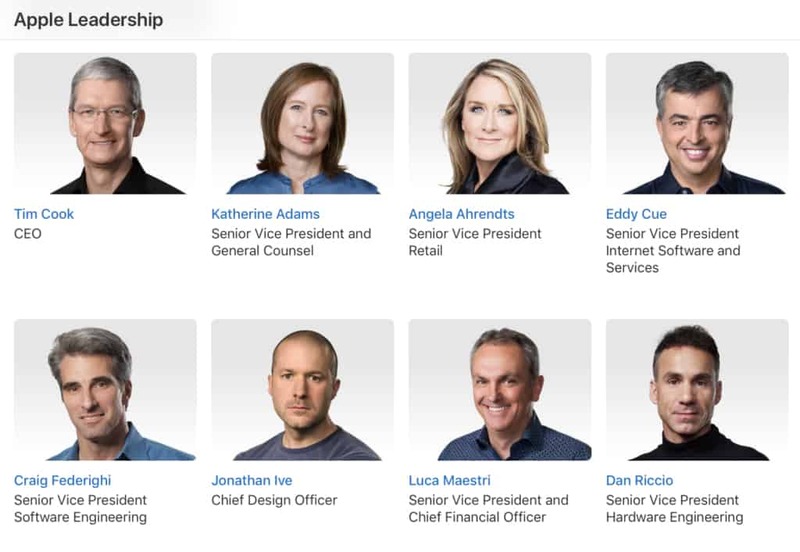 Tim Cook’s slightly crooked smile for his photograph is evened out and his eyes, like Ive’s, are uncharacteristically big. The most accurate, as judged by this writer’s eye, are the three executives to the right of Cook, Katherine Adams, senior vice president and general counsel, retail head Angela Ahrendts and Eddy Cue, senior vice president for Internet Software and Services. Cue already has the ideal eyes for an emoji character. Ahrendts or whoever was charged with running the official Apple photos through Memoji added glasses to her photo. Memoji gave Phil Schiller a mullet, extended the hairline of CFO Luca Maestri and exaggerated the curl of hardware chief Dan Riccio’s hair, though it did provide him with the shorn sides he usually sports. The least accurate creation was for hardware technologies chief Johny Srouji, who, at least for a day, looks like 1950s teen idol Frankie Avalon.